We’ve been hearing whispers through emails and smoke signals that the Nokia Nuron was indeed facing a short delay to launch. We can now officially confirm the delay as well as the March 24th launch date. Originally slated for the 17th, we’re not sure what the cause of the delay was and, frankly, since this phone only requires a $10 data plan, we’re willing to wait an extra week. The pricing details were missing from the launch announcement, but we’re still hearing the $69.99 for 2-year and $179.99 no contract are solid prices. That $179.99 no contract is a steal. Want more of the Nuron? Take a look here and here! I actually like the look of this Nuron…something about it. got to play with the phone today at a tmo store. it actually looks pretty nice and not so cheap. well made by nokia this time. screen doesn’t look cheap either. I actually like the looks of it to. It’s not what I’m looking for, but for the targeted audience it looks like a very nice device. got to play with it the other day, too. I’m a girl, so my hands are smaller. It fits perfectly. The HD2, which I am more inclined to get just to wag in my iphone friends’ faces more than anything, was humongous and I couldn’t even hold it very well. Honestly, I would love to get it the HD2 but I am clumsy to begin with and it would most likely slip out of my hands more often than not. I think I may be going for the Nuron. Just of curiousity…Do they normally release numerous new itmes on the same day? If the HTC HD2 release date holds true…doesn’t this makes a a launch day for the Dell Mini, Nuron and HD2 on the same day? Just of curiousity…Do they normally release numerous new items on the same day? If the HTC HD2 release date holds true…doesn’t this makes a a launch day for the Dell Mini, Nuron and HD2 on the same day? The BOGO deal is only for new activations and only for smartphones…this is considered a phone first phone. Its appearance is out of doubt stylish and elegant, but that’s all. I think its camera is disappointing and I’ll never consider of buying one. To me, this phone is the true successor to the Samsung Behold. Is the data plan required no matter what or just if you want a rebate? 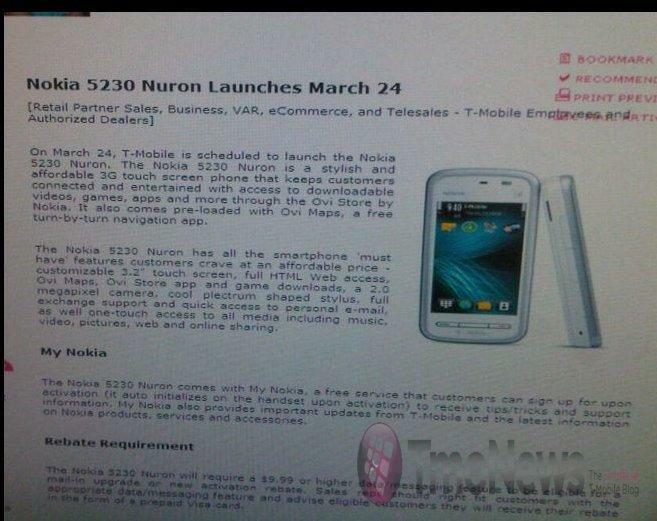 Ok, to clear up a few things… 1st, The Nokia Nuron IS part of the BOGO (check your facts before you post Paul), as long as you get the web, and for $10/month, that’s a steal for a tetherable gps/full browser/ovi marketplace phone. 2nd, The BOGO deal is ONLY for peopeople activating new lines on Even More plans with the required data plan. Legacy (myfaves etc..) and Even More Plus activations are NOT eligible! Flexpay is also NOT eligible! 3rd, TMobile often launches more than one phone at a time because there is often quite a bit of work that the retail stores must do to prepare for major launches and it just is easier to do it all at once. The Nuron is a sweet phone and is worth picking up for most people, I have used the phone for about a week now and it is pretty sweet. Hope that this helps answer most of the questions floating around. Hmmm. $10 monthly data…. Full web browser on $10 web? This might be a new trend worth looking into. I’m getting very tired of my G1. I’ve been wanting to see what S60 is all about being the rest of the world is all about it. Maybe I can scrounge up $170 to check it out. What do you think guys, trade in a G1 for a Nuron? sorry to bother. Does anyone know if the $10 plan is required? I have three lines two of which are expired. But I own the third one which expires in June. I was going to upgrade the first two and get a Nokia Nuron for my third line, but if a data plan is required , I cant do this, right? Sync with Outlook\Google calendar? If I can sync my Outlook\Google calendar and avoid the $30\month data plan, I would be all over this phone. Does anyone know if this phone will come in black? I know you can swap the battery cover to different colors, but I would like the front in black. looks like just white with switchable back covers according to nokia’s websites. I’m hoping someone can clear up a few quick things for me here. – Is the $10 data plan required for this phone? I’ve seen people go both ways on this. – The $10 data plan gives full web browsing access right? I’ve seen people say it’s just the basic web2go package. $10 web2go does give full browsing access…whether or not it’s required with this phone, we’ll just have to wait until the release date to find out! after reading the above posted image more carefully, the $10 web2go is ONLY required if you want to get the mail-in rebate…I’m pretty sure it’s not required for 2 years though so you can drop the web plan after you get the rebate.